Getting traffic to your website is one thing but getting them to make a purchase is a totally different ball game. You may be getting millions of visitors to your website each month but if they are not making a purchase on your website, if they are not increasing your sales then your cost of acquiring such customers will remain high and gross profit will remain low. The objective of carrying out conversion optimisation is to increase your website sales and to decrease your cost of acquiring customers. The number one method to increase your website sales and leads is not to send more traffic to your website. on a website. The rest of the 97-98% traffic does not make a purchase. So no matter how much traffic you send to your website, only 2-3% of the traffic will ever buy from you. The rest 98% traffic will not make a purchase. Many of us tend to live in a world where conversion rate is a universal constant and all we can do to increase sales is to send more traffic to our website. But more traffic does not always result in more sales. However it almost always result in more ad spend. Even if you are only doing SE0 to generate website traffic, you are still spending your time and resources in content development and marketing. So there is no such thing as free traffic. 1. You are not always acquiring the best customers through your marketing campaigns. 3. You are not spending enough on acquiring most profitable customers and thus loosing big on sales and net profit. 1. You are targeting mainly your potential customers. 2. You are making sure that the your potential customers make a purchase on your website. When we carry out conversion optimization on a website, we do not increase your website sales by sending more traffic to your website. What we do is focus on improving the quality of your existing website traffic and landing pages so that more existing traffic make a purchase on your website. What that means, if up to now, say only 2% of your total website traffic was making a purchase on your website then after carrying out conversion optimization, more than 2% of your website traffic start making a purchase on your website. The actual level of improvement varies from website to website and from industry to industry. So it is not possible to determine in advance what level of improvement you can expect for your website sales. But one thing is certain and that is you will see improvement in your website sales and conversion rate. Conversion optimisation will continue to benefit you for a very long time. 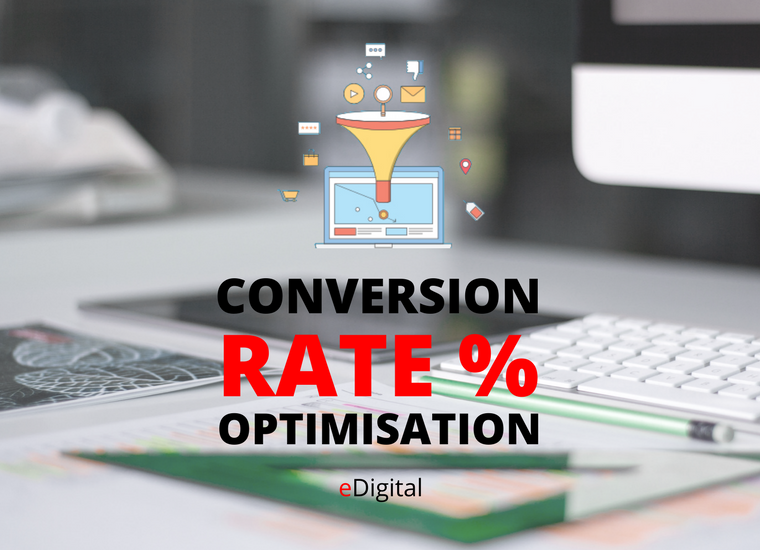 Even if you stop spending money on conversion optimisation at some point, you will continue to get the benefit from the increase in ecommerce conversion rate for a very long time. This is not really the case, if you are increasing website sales by sending more traffic to your website. Once you stop spending time and resources on increasing your website traffic, your traffic will deteriorate much faster than your ecommerce conversion rate. If in doubt, switch off all of your paid marketing campaigns and stop spending time and resources on doing SEO for the time being and you will get my point. How is conversion optimisation done? We start the conversion optimization process by asking you key questions about your business. The goal here is to understand your business, your goals, priorities and your target audience. next. We do that mapping in Google Analytics through Funnel Visualization reports. Once I identified the drop offs from one funnel step to the next then I do analysis to determine the reasons of such drop off and how these drop offs can be minimised or removed. These activities help in improving the website conversion rate and sales. What do we need in advance, in order to send you a proposal? optimum results and may even result in monetary loss. We first need to audit how you are tracking your data and whether it is even accurate. Also we will review what you are not tracking which may be required for funnel set up or to understand users’ behaviour. Access to your Google Analytics and/or Google Tag Manager accounts is required in order to create a proposal. I would also ask you couple of questions regarding your business and goals before sending a proposal. How much will conversion optimisation cost? There is no fixed price. Our fees depend upon the nature and scope of the work. Some websites require more work than others. Therefore it is important for me to understand your requirements before doing any cost and time estimates.